Concerts, comedy, movies, and more. Experience a variety of unique performances presented by the Rialto and its rental partners. Tickets to all Fall 2018 and Winter 2019 shows are ON SALE NOW! Located in the heart of downtown Loveland, the Rialto Theater Center is one of Northern Colorado’s premier event venues, offering affordable accommodations to suit a variety of events and programs. Join us on Thursday evenings this Summer at the Foote Lagoon for great live music, food trucks, and family-friendly activities. Tickets to all shows are available at the Rialto Theater Center Box Office. The Box Office is open 45 minutes before ticketed events for ticket sales to that event only. Tickets to all shows are available online. 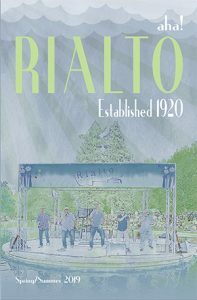 Click the link to see the line-up for this upcoming season at the Rialto Theater! Summer is right around the corner! Read more here.